At the NMFMA we are all about local food and supporting our Farmers’ Markets; sometimes we like to take things even more local and do it at home, especially when the markets have closed and we are craving fresh food. I like to grow sprouts, especially alfalfa, because they are hard to get at grocery stores and taste best when they are really fresh. Sprouts are packed with trace minerals, vitamins, and protein, all made available just by watering a seed! *I recommend a wide-mouth quart-size mason jar with a screw on lid and nylon screening, which is available at most hardware stores. Ready-made sprouting jars are available at most Whole Foods, coops, and other natural food stores for $5-$10. It’s true: for a quart-sized jar of sprouts you only need ONE TABLESPOON of seeds. They look pretty lonely at the bottom of the jar when you first start out, but as they sprout they fill up the jar; if you add more they may start to rot from overcrowding. Soak your seeds overnight (or about 8-10 hours). Then drain the water thoroughly into an empty jar (use it to water plants or drink it — it should not go down the drain in this drought-stricken state!) and turn the bottle on its side. Place the jar out of direct sunlight; seeds sprout better in the dark. I cover my jar with a cloth to further protect it from sunlight and to help maintain moisture. Once the seeds have been soaked and drained, “water” them twice a day (in the cooler seasons, you can get away with once a day). Run some cold water into the jar until the sprouts are thoroughly wet, then drain them completely. If sprouting seeds are too wet, they may rot; if they are too dry it is hard for them to grow. I err on the drier side, as rotting sprouts are a drag. The process takes less than 30 seconds. Then lay the jar back on its side and cover. You can see the sprouts grow every day. After 4-5 days the sprouts are an inch or longer. Now when you water, you can leave them in the light and watch them green up. Once they’re green, they are ready to eat! If you’re a purist, you may want to try and remove the seed husks that remain on some of the sprouts. They are tasteless and good as a fiber source, but your sprouts will last longer if you remove them. When your sprouts are green and ready, they need to be refrigerated. Put a plastic bag or cover over the jar so they do not dry out. Place the jar in a part of your fridge that is not really cold — they are quite fragile and can freeze easily. Throw these on sandwiches, in salads or in soups to add a fresh crunch to your plate during these sparse winter months. 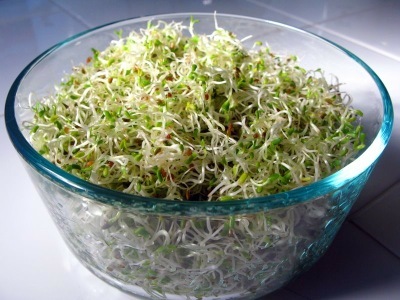 Alfalfa sprouts are low in Saturated Fat and Sodium, and very low in Cholesterol. They are a good source of Protein, Vitamin A, Niacin and Calcium, and a very good source of Dietary Fiber, Vitamin C, Vitamin K, Thiamin, Riboflavin, Folate, Pantothenic Acid, Iron, Magnesium, Phosphorus, Zinc, Copper and Manganese.